SUBMERSIBLE SUBSEA and ROV ELECTRIC MOTORS. Silvercrest/SME build and repair ROV submersible motors for all subsea applications. We design, manufacture, and supply, submersible electric motors for all SUBSEA and ROV, SUBSEA equipment, also for any special purpose submersible electric motor requirements. We repair and rewind large high voltage (500kW, 6600V) submersible electric motors. Manufacture Subsea and ROV motors suitable for depths of 4000M. 100 HP ROV Submersible / Subsea Motor. 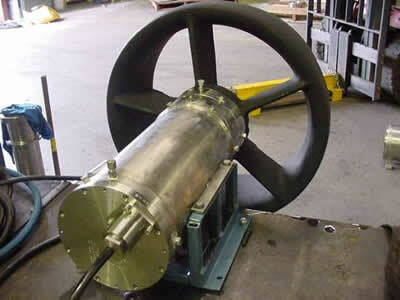 Silvercrest-SME has placed a 100Hp submersible subsea Rov motor (as illustrated below) on standby. For emergency availability to all Rov operators. The motor has the following specification and is a direct drop in replacement for the Curvetech 100HP unit. The motor is presently set up to receive a Rexroth A10VSO140 pump, but can be modified to accept other pump models if required. The motor is brand new, direct from our factory and has been constructed specifically for this purpose. Location England. Can be shipped immediately by land, sea or airfreight. ROV124-100HP, 4-pole, 3000v, 60Hz. Mil Spec hard-anodised T6 hardened 6061 grade Aluminium construction, with all 316 hardware. Rotor dynamically balanced. Oil filled externally compensated. Fully performance tested on Dynamometer at rated voltage and frequency. Subsea connectors for power and instrumentation. Designed for maximum electrical efficiencies to reduce full load currents. Motor designed for low operating temperatures to extend reliable lifespan. Specialised winding insulation system to ensure long operating life even under the most arduous of duties. On Deck operation generally allowable. 260kW Silvercrest/SME Pump Motor under construction. Silvercrest/SME have supplied six 400kw ROV20-4 motors, 4pole/3300vac/3 phase/60hz, stainless steel construction. Single ended for fitment with Sauer hydraulic pumps Series-90-L250. Rated for 3000m depth operations. Also three ROV204 submersible motors (300kw/4 pole/3300vac/3 phase/60hz) with stainless steel construction, and double ended for fitment with Sauer hydraulic pumps to SMD-Hydrovision. Together with 7.5kw motors for Rov cursor application. In addition we recently manufactured and delivered in just six weeks from order, ten 260Kw submersible motors to CTC Marine Projects based in Teeside, England. The motors will be used by CTC on their subsea plough and trenching vehicles worldwide. The 260kW/ 3000V / 60Hz / 2 pole pump motors (designed specifically for use in the horizontal axis) were fitted with shafts at both ends, in order to mate with three tandem mounted hydraulic pumps on one end and a Hayward Tyler M6 single stage water pump-set on the opposite end. 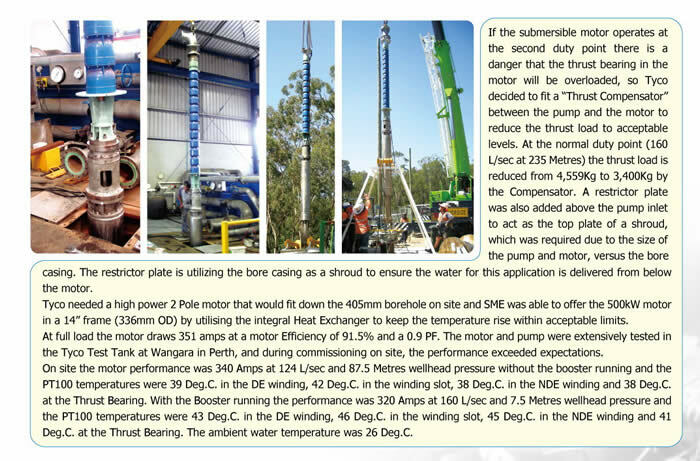 In this 260kW model, rather than using the pivot shoe arrangement, typical of vertically oriented pump-sets, heavy duty tapered roller bearings were fitted to the rotor to manage the water pump induced end-loads. Thus giving a calculated bearing life in excess of 11,000 hours, even when used in the horizontal axis. Depth rating on each motor is 10,000 meters, with oil filled compensation. 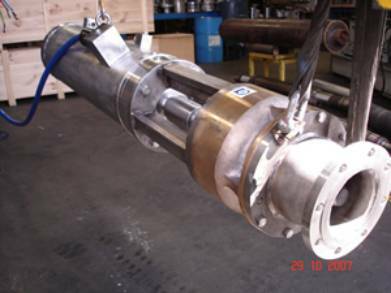 Motor housings are 316 stainless steel, with Mylar coated windings (the ultimate in winding coating technology) being used in each motor at the request of CTC, giving an insulation rating of >16kV at a temperature of 140 degrees C.
Silvercrest/SME will bespoke manufacture virtually any shape and size of submersible motor required for subsea operations. New Subsea Submersible motors for Dutch Submarine. The new propulsion system is 240VDC based, using a 6-pole SME submersible subsea motor with its invertor drive programmed for maximum frequency output of 40-45 Hz. Using a directly driven motor to propeller configuration, this relates to a top speed of 900RPM. The thruster nozzle and propeller were designed for optimum performance at this speed, with as linear a performance profile as possible. In order to improve the reliability of the system The new propulsion system is 240VDC based, using a 6-pole SME submersible subsea motor with its invertor drive programmed for maximum frequency output of 40-45 Hz. Using a directly driven motor to propeller configuration, this relates to a top speed of 900RPM. 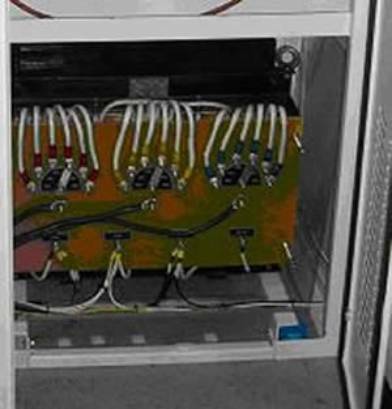 The thruster nozzle and propeller were designed for optimum performance at this speed, with as linear a performance profile as possible, and to reduce motor, invertor and associated cabling sizes, the battery buss voltage from each battery pod was connected in series via a new purpose built 240VDC distribution panel. 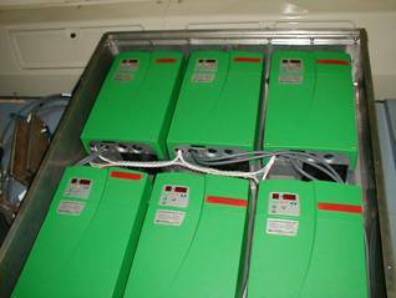 As the supply to the inverters was derived from a battery, the issue of supply frequency was not a concern. Therefore we opted for 50Hz inverter units as these are more ‘standard’ and therefore more readily available and cheaper. Silvercrest/SME controller specialists carried out the initial invertor installation and commissioning of the subsea motors and controllers. During installation the motor controller sets were ‘dynamometer’ tuned using an in-built optimization facility. The controllers can then be either generically programmed for use in any location or individually in-situ programmed to provide optimum operating performance for each given motor operating position. For motor speed control signals into the inverter, the simplest option, from a fault finding and maintenance point of view, was to provide an analog voltage signal (+10VDC to -10VDC). This option required a small interface bi-directional interface PCB that was mounted directly on the face of the controller. 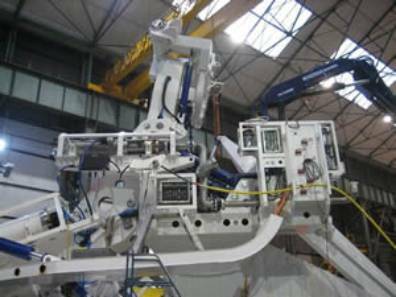 We have used this option on other manned submarine applications with excellent results. 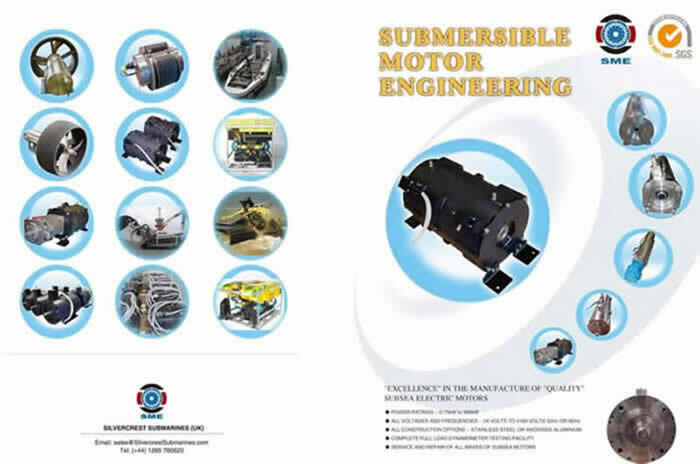 SUBMERSIBLE MOTORS, ROV MOTORS, SUBSEA MOTORS for sale. MOTOR-PUMP SETS, ROV HPU for sale. industries, and subsea to depths of 4000m. the more popular classes of subsea ploughs and Rovs. All of these motors are available in either SS316, Duplex, Super Duplex stainless steel, or with a hard anodized aluminium finish. We can offer subsea submersible motors with a wide range of speeds and voltages (including 3000v, 6000v and 10,000v). We can design and build motors to suit your individual and special project requirements. 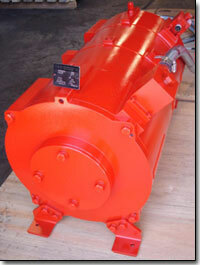 We refurbish and service a wide range of submersible motors. Our product is excellent, our prices very competitive, and our delivery schedule the best in the industry. Submersible Motor Engineering/Silvercrest is the world leader in submersible motor technology, enabling our customers to explore deeper underwater than ever before. High power, high voltage and high-pressure specifications are common place for many of our clients. Our submersible subsea and ROV motors are the best on the market today, offering a comprehensive choice of materials and design to underwater and ROV operators. Submersible Motor Engineering/Silvercrest specializes in all aspects of submersible electric motor operation, performance, and design. Due to industry demand for readily available quality parts, we also rewind, repair, redesign, and machine major components of other manufacturer's motors that require repair and re-manufacture. CONTACT US TODAY TO DISCUSS YOUR SUBSEA ROV MOTOR REQUIREMENTS. We recently delivered ten 260kW, 3000VAC, double ended, 2 pole, stainless steel bodied motors to CTC Marine Projects Ltd, for use on their fleet of sub-sea trenchers. This was a bespoke order that was completed in just six weeks from receipt of order. Also five 400kw, 4 –Pole, 3300/3/60, SS316 Construction, Subsea Submersible Motors for SMD. Silvercrest/SME supply submersible motors, HPU's, and motor-pump sets worldwide. Our customers include SMD, Saab SeaEye, Ldtravocean, Fugro, CTC Marine Projects, Perry Slingsby and many others. Subsea Trencher fitted with our SME 142-265KW stainless steel construction submersible motor and pump. Silvercrest/SME have manufactured and supplied six 400kw ROV20-4 motors, 4-pole/3300vac/3 phase/60hz, stainless steel construction. Single ended for fitment with Sauer hydraulic pumps Series-90-L250. Rated for 3000m depth operations. Also three ROV204 submersible motors (300kw/4 pole/3300vac/3 phase/60hz) with stainless steel construction, and double ended for fitment with Sauer hydraulic pumps to SMD-Hydrovision. Together with 7.5kw motors for Rov cursor application. SME has also manufactured a total of seven (7) 6600V motors todate, for three different offshore contracts. Petronas Dulang and Angsi Platforms. Star Energy KG Platform. A new Saab-SeaEye Jaguar ROV, fitted with our SME ROV12-2, 48kW 65HP, 2-pole, 3000/3/50, aluminium construction ROV submersible motor, and Rexroth hydraulic pump. Fitted with temperature sensing and water detectors. Epoxy coated for protection. Two submersible double-ended motors mounted with hydraulic pumps, fitted to a submarine digger. SME ROV14-4, 75kW/100HP, 4–pole, 3000/3/60, Anodised Aluminium Subsea Motors with Interface to suit the Hydraulic Pumps. 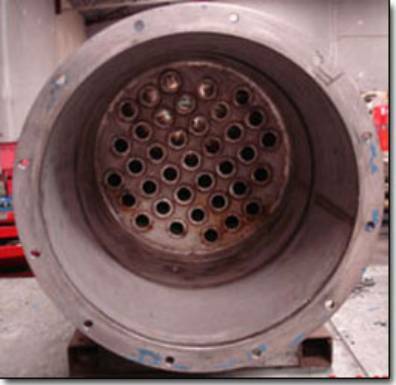 We manufacture and rebuild very large submersible motors for a range of other offshore and subsea companies. These include: Global Marine, CTC, Sonsub, Star Energy, Sulzer Wood, Sulzer, Fugro, Apache, BHP Billiton, Petronas, SMD, Exxon Mobile, Chevron, Perry Slingsby, Subsea7, Bayu Purnama, ISE Ltd, Saudi Aramco, Woodside, PXP. We will be very happy to discuss the details of your subsea motor / pump requirements in order to produce a detailed technical quote for you. Silvercrest / SME design and build specialized subsea motors, and support packages for use on all types of Rovs and underwater vehicles in the offshore and subsea industry. These submersible motors are usually made to order and vary from 1kW to 1500kW, 400 to 4160 Volts. 50 or 60 Hz, 2-Pole to 8-Pole. Stainless steel construction, or Marine Grade aluminium that is Black anodised to resist corrosion. These motors are usually oil filled and pressure compensated. Common operating voltages are between 300 volts and 3300 volts - even for small 5kW motors. 6,000vac and 11,000vac motors also available by special request. Certain subsea motors can operate down to depths of 10,000 meters. SME manufactures new Submersible, Subsea, and Rov motors. SME rewinds, services and repairs all brands of Subsea, Submersible and Rov motors. Including Hitachi, Pleuger, Grundfos, Mercury, Byron Jackson, Haywood Tyler, and Franklin. Silvercrest/SME specialize in the bespoke manufacturing of submersible motors, pumps and ancillary equipment for use on Rovs, subsea trenchers, subsea ploughs, dredgers and water lift pump systems, for use in the offshore Oil and Gas and Telecommunications industries. We manufacture our own laminations, designed specifically to meet the individual requirements of each customer. We do not buy off the shelf standard rotor sets and fit them in a housing, as some other manufacturers will often do. As a result our motors are more efficient and generally slightly smaller, in both diameter and length, than our nearest competitors for any given power rating. Silvercrest offer a range of ‘standard’ motors for use in well-established underwater installations, such as the more popular classes of Rov and subsea ploughs. Repair and rewind of large high voltage (500kW. 6600V) submersible electric subsea motors. 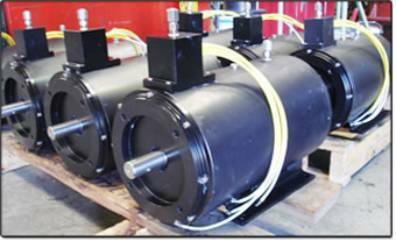 High Voltage water filled submersible subsea motors (3300V, 4160V and 6600V). Upgraded Temperature Monitoring units available with new improved user-friendly parameter setting. ROV and subsea submersible motors suitable for depths of 4000m. Subsea Electric Generators for Tidal Generation. Induction Generators or slow speed Permanent Magnet Synchronous Generators up to 500k. We now offer a complete range of water filled, watertight, submersible subsea motors with integral heat exchangers in 10-inch, 12-inch, 14-inch and 16-inch size for 2 pole and 4 pole speeds. These subsea motors offer a significantly lower temperature rise when compared with standard submersible subsea motors. This is an advantage that can be utilized when customers want to operate in water with a high ambient temperature, or when there will be minimal cooling water flow available. Even with the standard applications the lower temperature rise will extend the life of the motor significantly. There is an accepted rule of thumb for electrical insulation that its life is shortened by one-half for every 10°C increase in operating temperature. The winding operating temperature for a normal water filled submersible motor is about 70 degrees.C, in 25 degree.C water. However an SME Heat Exchanger Motor will be running at about 45 degree.C. (This is 25 degrees cooler). This magnitude of difference in temperature rise will have a significant positive impact on motor life. subsea motor has an improved efficiency because the stator and rotor copper losses are reduced due to the lower operating temperature. All SME Heat Exchanger Motors come with four (4) PT100 temperature sensors installed in the motor. One PT100 is attached to the thrust bearing assembly that will detect excessive thrust loads and overheating in the thrust bearing. One PT100 is installed in the end winding on the non-drive end of the motor. One is installed half way down the slot in the winding in the middle of the motor. One is installed in the end winding on the drive end of the motor. SME can offer one temperature protection unit (SME4TM) to monitor all four PT100'S installed in the Heat Exchanger Motor. Our water pump motors are not vertically oriented, water filled, down hole pump motors, as has previously been the norm throughout the subsea industry. 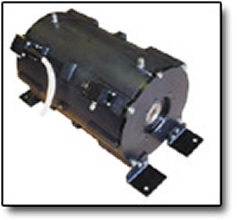 Silvercrest/SME motors are substantial oil filled submersible motors, designed to run in the horizontal axis with a large thrust bearing assembly to withstand water pump loads. Silvercrest recently delivered ten 260kW, 3000VAC, double ended, 2 pole, stainless steel bodied motors to CTC Marine Projects Ltd. The motors will be used by CTC on their subsea plough and trenching vehicles worldwide. This was a bespoke order that was completed in six weeks from receipt of order, ex-works from our manufacturing facility in Australia. Rov and Subsea Plough and Trencher Motors. Silvercrest offer an established range of Rov motors ranging from 5HP to 500HP. All of these motors are available in either SS316 or Hard Anodized Aluminium finish. submersible motors to suit your individual requirements and subsea project. Our motors are in use with most of the major operators worldwide such as Saipem, SMD Hydrovision, Sonsub, CTC Marine Projects, Impresub, Fugro, Thales, MTQ, LD Travocean and Canyon Offshore. 100HP Aluminium Bodied ROV HPU Motor. 400Kw Motor/3000vac for Subsea Trencher. Submersible ROV HPU and Compensation Units. Silvercrest/SME manufacture and supply a wide range of electric submersible motors, motor-pump sets, together with matched hydraulic pumps (HPU) or water pumps. We can supply ROV HPU submersible motors from 30kW to 250kW, trenching HPU submersible motors from 100kW to 450kW, trenching jetting pumps, plough HPU submersible motors, plough jetting motor pump sets, turbine and centrifugal water pumps, hydraulic pumps, Rexroth A7 and A10 series pumps, and Sauer 90 series & Kawasaki KV3 series pumps. We also offer a range of subsea components for manned submersibles, ROVs, submarines, subsea trenchers and subsea ploughs. Also oil compensation units (Compensators). We supply AC thrusters as direct replacements to existing DC thrusters from 1kW to 50kW in size. Silvercrest/SME supply oil compensator units for subsea vehicles, to suit manned submersibles, ROVs, submarines, subsea trenchers and subsea ploughs, and subsea equipment. We can offer a range of oil compensation unit sizes, including a 2.7L Compensator. 7 x 1/4" NPT (BSPT). SA-HC-0745-MAS. This is a rolling diaphragm, positive pressure compensator (2700cc capacity), manufactured in corrosion resistant plastic suitable for ROV and tooling applications. Size – 270cc, 2700 cc, 13.5L. Motor-pump sets (depth rated to 3000m) for subsea trenching operations. Silvercrest/SME has recently manufactured and supplied two 265kw motor-pump sets for SMD-Hydrovision (England). The package comprised 265kw subsea motors, 2-pole, 3000v, 3ph, 60hz. Together with Jetting Pumps (wet end only, operating at 2-pole, 60 hertz). The motors were a stainless steel construction, and the pumps Zinc Free Bronze. These motor-pump sets will be installed onto one of the world’s largest subsea trenching vehicles. 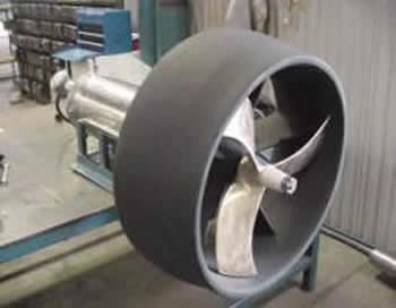 In addition, Silvercrest /SME has manufactured and delivered in just eight weeks from order, two water turbine pumps to CTC Marine Projects based in Teeside (England). The pumps will be used by CTC, in conjunction with Silvercrest/SME submersible 260Kw motors, on their subsea plough and trenching vehicles worldwide. Pump Castings - AS1830/T260 Grey Cast Iron. Impeller Casting - PB1 Zinc Free Bronze. Shaft Bearings - PB1 zinc free bronze casing. Splined natural rubber. Upthrust Bearing - PB1 Zinc Free Bronze. Maximum Pump Thrust - 1470kg at Shut-Off. 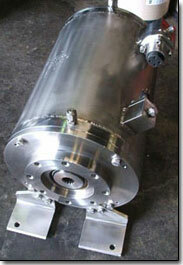 Examples of Submersible motors we have manufactured. SME 10-inch motor, 110kW 2P 400V 50Hz Super Duplex Construction for Service Water Lift Pumps. SME 6-inch motor, 1.1kW 6P 400V 50Hz Super Duplex Construction for a Hazardous Open Drains Pump. SME 6-inch motor, 25kW 2P 400V 50Hz Super Duplex for Fire Water Jockey Pumps. SME 36-inch, 550kW -540HP, 4 Pole, 10000/3/50, Super Duplex Construction Submersible Motor. 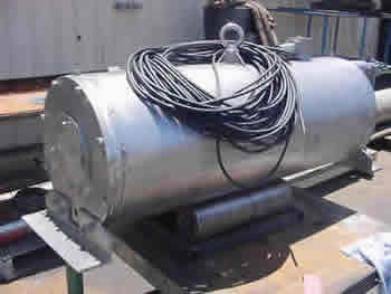 SME 36-inch, 1100kW-1475HP, 4 Pole, 10000/3/50, Super Duplex Construction Submersible Motor. SME 12-inch 150kW 200HP 4 Pole 480/3/60 Super Duplex Construction Submersible Motor c/w 60M of Submersible Cable. SME 36-inch 2200kW 6-Pole 6600/3/60Hz Super Duplex construction. Submersible Motor. Submersible motors with 60hz frequency, 1180rpm speed, 6,6KV voltage, and 2000kW power rating. Complete with 50m power cable, and PT100 with 50m instrument cable. To be used as fire water pump drive units. SME 36-inch, 2200kW, 6 Pole, 6600/3/60Hz, submersible motor. Super Duplex Construction. SME 36-inch, 2200kW, 6 Pole, 6600/3/60Hz submersible motors. 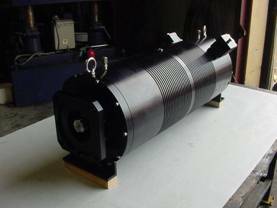 SME 36-inch, 1800kW, 4 Pole, 6600/3/60Hz Submersible Motor. SME ROV24-6, 400kW, 6 Pole, 4100/3/30-64, SS316 Construction Motor, Double Ended to have Water Pump on one end and a Hydraulic Pump at the other end. Max Axial Thrust 100kN, Max Radial Thrust 40kN. 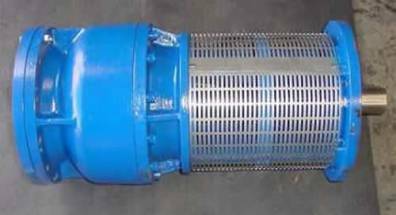 SME SS132-4, 5.5kW, 4 Pole, 400/3/50, SS316 Construction Subsea Motor for Thruster application (reversing Propeller mounted directly on shaft). SME ROV16-2, 400kW, 2-Pole, 3300/3/60, SS316 Construction Subsea Motor with integral Thrust Bearing and Interface to suit operation with Water Pump (vertical operation). SME ROV12-2, 48kW 65HP, 2-pole 3000/3/50, Aluminium Construction ROV Motor fitted with Rexroth A10VO28DFR1/31R-PSC62N00 Hydraulic Pump. Motor to have Burton Connector for Power Leads. Fitted with Temperature Sensing and Water Detectors terminated on Subconn or similar connector. Power Conductor and Sensor Connector Blocks to be in the same position on the motor at opposite ends (or as requested). Epoxy coated for protection. SME ROV14-4 75Kw/100HP, 4-pole, 3000/3/60, anodised aluminium subsea motor. Double-ended motor with Interface to suit Sauer and Kawasaki Hydraulic Pumps. 300 kW electric motor, 1800 rpm, 4160V 60Hz, electric supply, with adaptation flange to fit with Sauer Danfoss hydraulic pump 90 R 250 type, standard splined shaft. Electric motors, 1800 rpm, 4160V 60Hz electric supply, each with adaptation flange to fit with Sauer Danfoss hydraulic pump 90R130 type, standard splined shaft. These motors are used on a undersea trenching machine. SME ROV14-4, 66kW/88HP, 4-pole, 3000/3/60, Anodised Aluminium Subsea Motor, with Interface to suit Hydraulic Pump. SME ROV10-2, 75HP, 2 – Pole, 3000/3/60, SS316 construction. Subsea Motor fitted with SMP 9WH-4 Stage NAB Construction Pump to provide 4000L/M at 5Bar or 1060GPM at 170ft Head. Motor is oil filled and externally compensated. Tube connection for Power and Subconn or equivalent connector for Water Detector and Temperature Monitoring. SME ROV22-14, 120HP, 14-Pole, 3000/3/60, SS316 construction. Subsea Motor fitted with Jetech 15055-UW-H Subsea Quintuplex High Pressure Pump to provide 50L/M at 850Bar. Motor is oil filled and externally compensated. Tube connection for Power and Subconn or equivalent connector for Water Detector and Temperature Monitoring. SME ROV22-12, 120HP, 12-Pole, 3000/3/60, SS316 construction. Subsea Motor fitted with Jetech 100J3-UW-H Subsea Triplex High Pressure Pump to provide 46L/M at 850Bar. Motor is oil filled and externally compensated. Tube connection for Power and Subconn or equivalent connector for Water Detector and Temperature Monitoring. SME ROV14-100HP 4 pole 3000/3/60 Anodized Aluminium Construction Motor fitted with Rexroth A10VO85DFR1/53R-PUC62N00 Hydraulic pump giving 145l/m at 207 Bar. 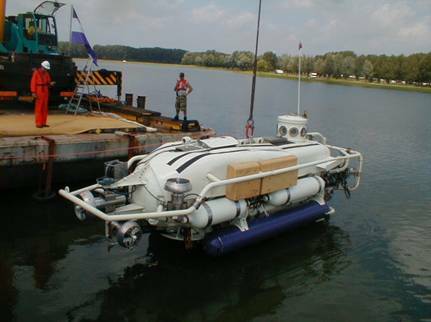 Submersible motor for operations at 6000m. We can offer our SME ROV22-12, 150kW, 12-Pole, 500rpm, 3300/3/50, SS316 Construction Subsea Motor. This motor will be manufactured to your exact requirements, and to interface with your submersible pump. SME ROV14-2, 186kW 250HP, 2-Pole, 3300/3/50, SS316 Construction Subsea Motor, with Flange and shaft to interface with Water Pump. Submersible Motor. Power 15 kW, Speed 2910 1/min, voltage 3.3kV, working depth 300m. SME ROV10-2, 15kW 20HP, 2-Pole, 3300/3/50, SS316 Construction Subsea Motor, with Flange and shaft to interface with Water Pump. SME 400kw 4-Pole 1500rpm 3300/3/50 Submersible Motor. SME 400kw 4 Pole 1500rpm 6600/3/50 Submersible Motor. SME 145kw 8 Pole 1500rpm 3300/3/50 Submersible Motor. SME 145kw 8 Pole 1500rpm 6600/3/50 Submersible Motor. SME ROV18-4, 300kW, 4 Pole, 1800rpm, 3000/3/60, SS316 Construction Subsea Motor to drive Hydraulic Pump. SME ROV10-4, 40kW, 4 Pole, 1800rpm, 3000/3/60, SS316 Construction Subsea Motor to drive Hydraulic Pump. SME 10-inch, 37kW 50HP, 2 Pole, 380/3/50, Ni Al Br Construction Submersible Motor, with Modified Shaft and Flange to replace a Hayward Tyler MS 201-50 Motor and pump. 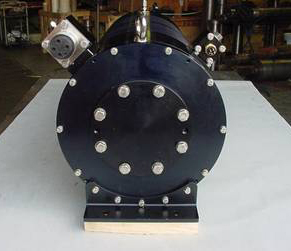 SME 10-inch, 37kW 50HP, 2 Pole, 380/3/50, Super Duplex Construction Submersible Motor with Modified Shaft and Flange to replace a Hayward Tyler MS 201-50 Motor and pump. SME ROV14, 250kW, 4 Pole, 3000/3/50, SS316 Construction Subsea Motor fitted with A4VG250EP4D1/32R-NSD10F001DP Hydraulic Pump. SME ROV14, 250kW, 2 Pole, 3000/3/50, SS316 Construction Subsea Motor to Drive Water Pump. SME ROV14-4, 60kW, 4 Pole, 3000/3/50, SS316 Construction Subsea Motor fitted with A4VG40EP4D1/32R-NSC02F013DP and A10VO28DFR/31R-PSC62K01 Hydraulic Pumps at either end. SME ROV14-4, 150kW 200HP, 690/3/60, Anodised Aluminium Construction Subsea Electric Motor. Fitted with a Rexroth A11VLO260LRDS/11R-NTD12N00 (CW ROTATION) PUMP-PISTON-VARIABLE at one end, and a Rexroth AZPW-2x-019-022LRRXXMB-SO593P (CCW ROTATION) PUMP-SINGLE-GEAR-SAE`A` 19cc, at the other end. Motor will have Oily tube for Power, and Subsea Connector for Temperature and Water Ingress Sensors. Motor available in SS316 stainless steel if preferred. Strip down and through inspection of the complete motor. Cleaning and anti-corrosion treatment as required. Drive end-bearing replacement if required. Motor Insulation and Dynomometer testing. Rebuild of the complete motor, test and despatch by sea or airfreight. SILVERCREST / SME manufacture Submersible motors, ROV motors, and Subsea electric motors to your exact technical specification. We also offer complete submersible electric motor rewinds, rebuilding, electrical conversion, and construction modification. SILVERCREST / SME can repair, rewind, and completely rebuild the following listed motors. We have manufactured many 6.6kV motors, mainly Submersible Pump Motors for various Mining, and Offshore applications. SME ROV22-4 300kW 4 Pole SS316 Construction 6600/3/60 Subsea Motor to drive Hydraulic Pump. SME ROV18-4 300kW 4 Pole SS316 Construction 4100V Subsea Motor to drive Hydraulic Pump. SME ROV22-4 300kW 4 Pole SS316 Construction 4500/3/60 Subsea Motor to drive Hydraulic Pump. The method of construction changes at 4100V from Random Wound to Formed Coils so there is a jump from 4100V to the 4500V motor. The 4500V motor is constructed very similarly to the 6600V Motor. SME ROV12-2 48kW 65HP 2-pole 3000/3/50 Aluminium Construction ROV Motor fitted with Rexroth A10VO28DFR1/31R-PSC62N00 Hydraulic Pump. Motor to have Oily Tube connection for Power Leads. Fitted with Temperature Sensing and Water Detectors terminated on Subconn or similar connector. Epoxy coated for protection. SME ROV14, 200kW, 268HP, 4 Pole, 3000/3/50, 1490rpm Stainless Steel Construction Subsea Motor designed to close couple to Rexroth A11VLO190DRS-11-LN-12N00 Hydraulic Pump. 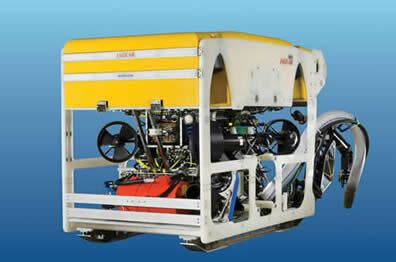 SME ROV10-4, 50HP, 4-Pole, 1000-3000/3/50 Anodised Aluminium Construction Subsea Motor. Fitted with Rexroth A10VO45DFR1/3xR-PSC62N00 Hydraulic Pump to provide 66L/m at 200 Bar. Motor fitted with Oily Tube connection for Power and Earth. Temperature and Water Detectors terminated in Subconn Connector. Hydraulic pump close coupled to Motor. 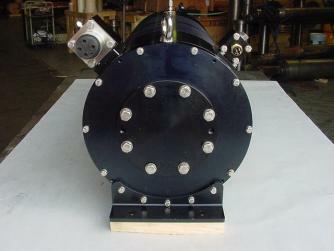 SME ROV14-2 motor, 265kw 2-pole 3000/3/60 with Stainless Steel Construction. Fitted with a PTS Sterling 350D-1 ZFB Pump (wet end only). Operating at 2- pole, 60 hertz. Thrust developed at duty: 1820kg. Thrust at Shut-off: 3016kg. Approx. length of pump: 750mm. 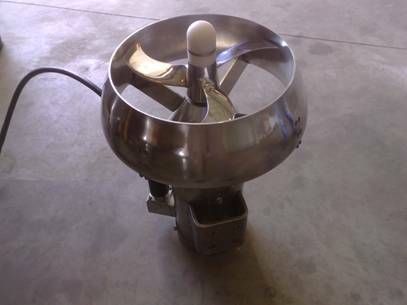 Bowl diameter: 340mm. SME ROV14-2 300kw 2 pole 3000/3/60 Oil filled Stainless Steel Motor with In built Circulation System and Heat Exchanger coupled to a Sterling 300M-3 Zinc Free Bronze Pump with a duty of 828cu.m/hr at 9 Bar. ROV20-4 type motors, 4 pole/6600vac/3 phase/60hz, with stainless steel construction. Double Ended for fitment with Sauer hydraulic pumps Series-90, with Subsea Connectors for Power and Sensors. We can offer the ROV20 motor with shafts at both ends, to mate with the Sauer Series 90 pumps . SME ROV24-6, 400kW, 6-Pole, 4100/3/30-64, SS316 Construction Motor. Double Ended to have Water Pump at one end, and the Hydraulic Pump at the other end. SME ROV228, 325kW, 8-pole, 3300/3/60, SS316 construction, Subsea Motor to drive Water Pump. SME 36-inch 2200kW 6-Pole 6600/3/60Hz Super Duplex construction. 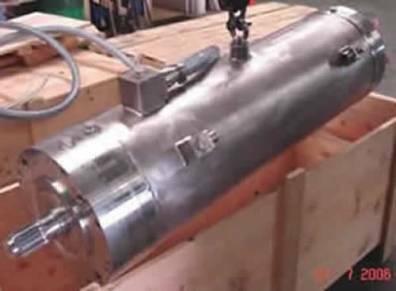 Submersible Motor manufactured for a shaft down application. Motor fitted with 4 x PT100 (3 internally in the windings, 1 on the thrust bearing ). Suitable for connection to CD pump. SME 36-inch, 550kW -540HP, 4 Pole, 10000/3/50, Submersible Motor, Super Duplex Construction. SME 36-inch, 1100kW-1475HP, 4 Pole, 10000/3/50, Submersible MotorSuper Duplex Construction. SPECIFICATIONS FOR SME SUBSEA ELECTRIC MOTORS. Flexible External Dimensions to suit all applications. Dimensions to allow drop in replacement for existing units. Anodised aluminium, 316 stainless steel, Duplex. Power drive to load using an output shaft with a standard coupling, or, close coupled, etc. Single drive shaft, or, a drive shaft at both ends, (double shaft extension). SME can design and build a motor with a completely new lamination to meet special design requirements, if necessary. in size and suitable for heavy duty applications, like trenching. load operation. If the motor is going to drive a hydraulic pump we recommend a close coupled arrangement to save the weight of the coupling and the coupling housing. SME can design and build motors for all voltages from 24 Volts to 6600 Volts with 50Hz or 60Hz frequencies, or for VVVF requirements. High Voltage motors can have random stator windings, or formed coils, depending on space and weight constraints. The winding wire for the High Voltage motors is double insulated and passes a twisted wire test at 16,000 volts and is rated up to 155 Deg.C. All windings are designed to keep 'turn to turn' voltage to a minimum. All winding materials and cables, etc. are specially selected to be suitable for use in hydraulic oil. In general the SME SUBSEA motors have low loss lamination steel (3 Watts/kg), which allows for higher flux densities, and less heat, with less material and weight. All motors are oil filled and we recommend hydraulic oils for good lubrication characteristics in preference to electrical oil that has better di-electric capabilities, but worse lubrication capabilities. If motors are going to drive a water pump SME can design the motor to take the thrust load from the pump, and keep the sea water out of the motor with a single or double mechanical seal arrangement. To ensure the integrity of the motor housing SME does not use castings. All components are machined from solid or from extrusions. The external aluminium components are typically 6061 T6 marine grade aluminium and hard anodised to a military specification. All ball bearings are from well known brands such as SKF, FAG, or NSK. Oil seals are high temperature and typically made from Viton. Mechanical seals are typically Burgmann. All hardware used on SME SUBSEA motors is 316SS. All fixing holes are blind except the "oil in" and "oil out" fittings and the stator pack fixing bolt, if applicable. The preferred power cable entry system for SME motors is to use an "oily tube" connected to an adaptor that is part of an oil tight rubber gland, which is fixed to the stator frame. SME do not recommend bringing the power cables through the endshields of the motor because this creates additional complications when the motors are stripped down during service, because the endshields cannot be readily removed from the stator. 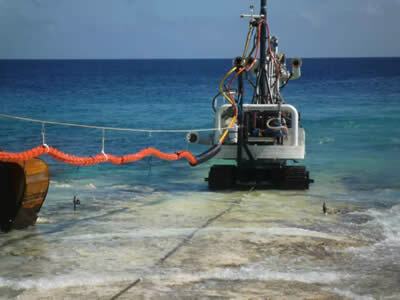 Subsea connectors can be offered as an alternative to the Oily Tube if requested. tight, plug and sockets as supplied by "Subconn", "Impulse", and "Burton". These are also fitted to a connection block on the stator, not on the endshield. All finished motors are pressure tested to ensure they are "oil tight" and suitable for compensated operation down to 4000 metres. All motors are rated for continuous operation and all prototype motors are full load performance tested rated voltage and rated frequency to confirm their performance characteristics. All motors can be issued with a "Type Test Certificate" or even full load tested at additional cost, if required. SME can also offer to arrange for hydraulic pumps to be set up and tested on the motors at rated voltage and frequency. 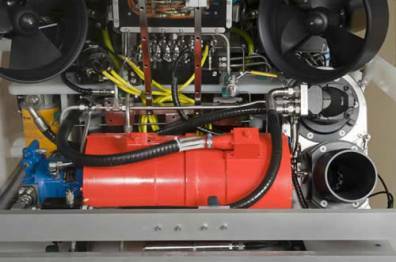 SME can offer to supply Hydraulic Power Units complete with the addition of a customer specified Hydraulic Pump. SME is a fully quality assured company to ISO 9001.2000 for "Design, development, manufacture, and testing of submersible electric motors and electric motors for remotely operated vehicles". SME Subsea motors can be designed and built for all subsea applications, such as ROVs, Trenchers, Ploughs, Submarines, Dredges, etc. All makes of subsea motor can be serviced, repaired and tested by SME. In some cases the original motors can be significantly upgraded. If you are having problems with your existing subsea motors please contact SME - we are keen to help and we are very price competitive. At SME we are continually working on improving the performance of our products and for this reason we reserve the right to make changes without notice to any of the data in this brochure. Please contact us direct for confirmation of any drawing dimensions or performance data. SUBSEA MOTORS and ROV MOTORS. 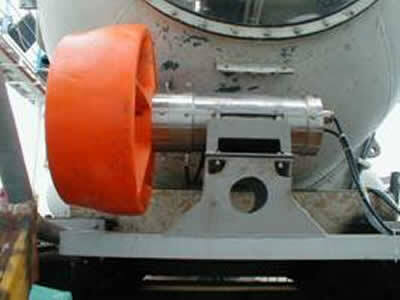 SME are designing and building specialized motors for use SUBSEA for the offshore industry. These motors are usually made to order and vary from 1kW to 600kW, from 400 to 4160 Volts, 50 or 60 Hz, 2-Pole or 4- Pole. There are two common methods of construction - stainless steel construction or Marine Grade aluminium that is Black anodized to resist corrosion. These motors are usually oil filled and pressure compensated and the common operating voltages are between 2300 volts and 3300 volts - even for small 5kW motors. Some of these motors operate at depths down to 4000 meters. SILVERCREST / SME MOTORS FOR OUR SUBSEA CLIENTS. We are pleased to be able to offer a replacement motor to meet your specific requirements. EXAMPLES OF OTHER SUBMERSIBLE AND SUBSEA MOTORS WE HAVE MANUFACTURED. 55HP hydraulic power pack motors. ROV 14-55HP, 3000V, 60Hz, 4 Pole Motor (with pump attached). Housing 316 SS or Hard Anodized Aluminium. Shaft Seals Bergman mechanical seals. Single pump motor to replace a Hayward Tyler Sumo 260kW motor. We can offer the ROV14 motor with shafts at both ends; to mate with 3 x tandem mounted hydraulic pumps on one end, and a 2-stage Plueger MI16 water pumpset on the opposite end. The female spline can be manufactured to mate with the supplied pumpset. Our purpose built pump motors are designed specifically for use in the horizontal axis. Unlike a down hole pump motor such as the HT Sumo, our motors do not use pivot shoe thrust assemblies. As a result our motors are compensated for depth pressure using oil rather than distilled water as in the case of down hole pump motors. Unlike most motor manufacturers, we manufacture our own core laminations on site, affording maximum flexibility in design. We can bespoke manufacture virtually any shape of motor you may require. In this 260kW model, rather than use the pivot shoe arrangement, we fit heavy-duty tapered roller bearings to the rotor to manage the water pump induced end loads. Thus increasing the reliability and service life of the motor by a factor of 10 or more when used in the horizontal axis. Our superior Mylar coated windings are the ultimate in winding coating technology. Mylar coated windings have an insulation rating of >16kV at a temperature of 140 degs C. No other winding coating even comes close to this standard. The final specification will need to be agreed upon placement of an order. Insulation rating using Mylar windings. 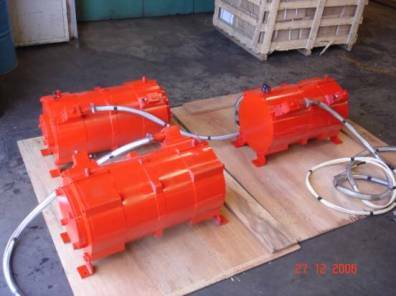 250kw/ 3300V / 50Hz / 4 Pole motors for Hydraulic Power Packs. New submersible motors, for your hydraulic power pack project The requirement being for 250kw, double ended drive, 3300V / 50Hz, 4 pole, motors with subsea connector to be defined. 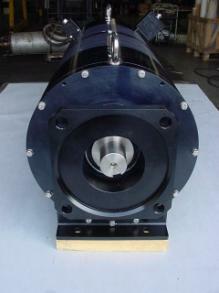 ROV20-4 motors, 250kw/4 pole/3300vac/3 phase/50hz, with stainless steel construction. Double Ended for fitment with hydraulic pumps, with Subsea Connectors for Power and Sensors. 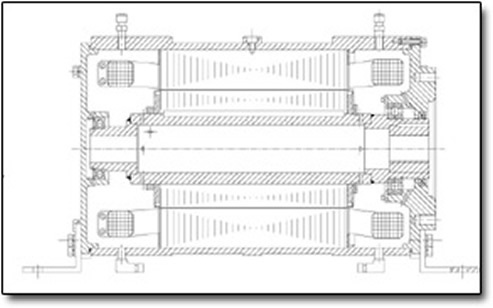 In addition we can supply if requested cooler/heat exchangers (at additional cost), for each of the motors purchased. Our purpose built pump motors are designed specifically for use in the horizontal axis. Unlike a down-hole pump motor such as the HT Sumo, our motors do not use pivot shoe thrust assemblies. As a result our motors are compensated for depth pressure using oil rather than distilled water as in the case of down-hole pump motors. Our superior Mylar coated windings are the ultimate winding coating technology. 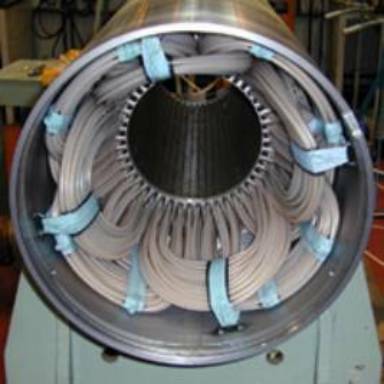 Mylar coated windings have an insulation rating of >16kV at a temperature of 140 degrees C. No other winding coating even comes close to this standard. Volts 3300Vac / 50hz / Three Phase / 4 pole. Instrumentation Motor fitted 1 x RTD water detector, and temperature probe. Connectors Power and Sensors (To be agreed). SME ROV10-2, 75HP, 2-Pole, 3000/3/60, SS316 construction. Subsea Motor fitted with SMP 9WH-4 Stage NAB Construction Pump to provide 4000L/M at 5Bar or 1060GPM at 170ft Head. Motor is oil filled and externally compensated with oil. Tube connection for Power and Subconn or equivalent connector for Water Detector and Temperature Monitoring. SME ROV22-14, 120HP, 14-Pole, 3000/3/60, SS316 construction. 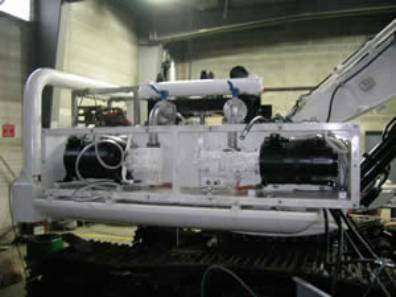 Subsea Motor fitted with Jetech 15055-UW-H Subsea Quintuplex High Pressure Pump to provide 50L/M at 850Bar. Motor is oil filled and externally compensated with oil. Tube connection for Power and Subconn or equivalent connector for Water Detector and Temperature Monitoring. This unit is operating at the lower end of its range and can have an increased output if necessary. SME ROV22-12, 120HP, 12-Pole, 3000/3/60, SS316 construction. Subsea Motor fitted with Jetech 100J3-UW-H Subsea Triplex High Pressure Pump to provide 46L/M at 850Bar. Motor is oil filled and externally compensated with oil. Tube connection for Power and Subconn or equivalent connector for Water Detector and Temperature Monitoring. SME 400kw 4-Pole 1500rpm 6600/3/50 Submersible Motor. SME 145kw 8-Pole 1500rpm 3300/3/50 Submersible Motor. SME 145kw 8-Pole 1500rpm 6600/3/50 Submersible Motor. SME ROV102, 40kw, 2-pole, 380/3/50(or 60hz), 40Kw submersible electric motor, oil filled, with SS316 Construction. Speed 3000 rev/min. Starting Direct. Service continuous. Electric connection Seacon (connector fixed + flying to be moulded to umbilical). Installation Horizontal. SME ROV14-2 200HP 150kW 2-pole 3000/3/60. Anodised Aluminium Construction Motor to suit operation with Water Jetting Pump. The exact Flange and Shaft requirements to be advised by the client. SME ROV14-4 200HP 4-Pole 3000/3/60 SS316 Construction Subsea Motor to fit Close Coupled Hydraulic Pump. Rexroth Hydraulic Pump A11VLO260DRS-11RNSD21-N00 with Variable Displace and Max flow of 260L/M at 180 Bar. SME ROV14, 200kW, 268HP, 4-Pole, 3000/3/50, 1490rpm Stainless Steel Construction Subsea Motor. Designed to close couple to Rexroth A11VLO190DRS-11-LN-12N00 Hydraulic Pump. The motor will cool itself in the ambient seawater. Sensors and electrical connector. SME 50 HP/ 3300V / 60Hz / 4 Pole HPU Motor. 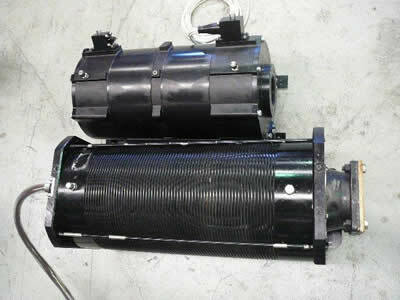 ROV and trencher HPU motors. The motor in the photograph is a 150HP ROV HPU motor as delivered to Fugro Ltd for use on the FCV ROV. With modifications to the pump mount and shaft and foot mounts arrangements, to suit the Linde HPR160 hydraulic pump unit. This motor is available in either hard anodized marine grade Aluminium or in SS316 stainless steel construction. 400kW/ 3300V / 60Hz / 4 Pole motors for Hydraulic Pumps. These motors being used to power Sauer Series-90-L250 hydraulic pumps. The requirement being for 400kw, single ended drive, 3300V / 60Hz, 4-pole, with subsea connector to be defined. The motors being required for an underwater vehicle. ROV20-4 motors, 400kw/4 pole/3300vac/3 phase/60hz, with stainless steel construction. Single ended for fitment with Sauer hydraulic pumps Series-90-L250, with subsea connectors for power and sensors. Our purpose built submersible pump motors are designed specifically for use in the horizontal axis. SME motors are compensated for depth pressure using oil rather than distilled water as in the case of down-hole pump motors. Our superior Mylar coated windings are the ultimate in winding coating technology. Mylar coated windings have an insulation rating of >16kV at a temperature of 140 degrees C.
Volts 3300Vac / 60hz / Three Phase / 4 Pole. SME ROV8-4, 5.5kW, 4 Pole, 400/3/50, SS316 construction Subsea Motor for Thruster application (reversing Propeller mounted directly on shaft). This motor was designed as a thruster motor and has an in-built thrust bearing arrangement to handle thrust in both directions. The drawing is for a 2-pole motor but the 4-pole version would be a similar size. The motor mounting arrangements and shaft requirements can be modified to suit different customer applications. Full Factory Rewind and service of 260kw motors. Rebuild of the complete motor, test and despatch by sea to UK. Burton power connector to be disconnected. All ports will be opened from 3/8 to ½ BSP as requested. 132Kw/ 1100v/2 pole/50hz/Foot Mount Motor. 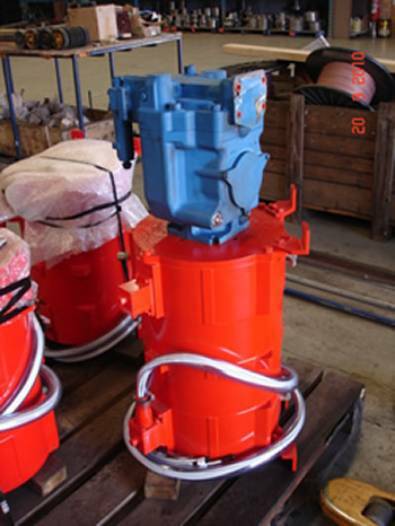 A replacement 132kw Brook motor for use in a salt mine. We are pleased to be able to offer you our direct replacement SME 132kW/2P/1100V/50Hz/RC315S/M Foot Mount Motor. This unit will be very similar to the Brooke mine motor (Type: W-DF315SN. Serial number: B033586), and have the same voltage and feet spacing as the Brook motor. Please note this is a standard air-cooled motor with the terminal box on top. It has no mining approvals or flameproof approvals. The Brook motor is fitted in a 315S-frame (508 and 406mm foot dimensions). The SME motor will be fitted in a frame with the same foot dimensions. SME ROV104-65HP-3000V- 50HZ submersible motor. Deepwater subsea motors for your 4500m ROV system. The motors to be used in the HPU (Hydraulic Power Units) of a 0hp ROV at a depth of 4500m without a TMS. The pumps for the HPU, will be Rexroth axial piston pumps, type AA10VSO71DRG/31R-PPA12N00. These are pilot controlled constant pressure pumps, with a displacement of 71cc/r, maximum output pressure 240bar, and shaft speed 1500rpm. Our SME ROV104-65HP-3000V-50HZ Submersible Motor. Construction in aluminium alloy. This motor will be manufactured to your exact requirements. Sensors: We have quoted a Subsea Connector to allow Pin Outs for 1 x RTD for Temperature, and 1 x Water Detector. Power: We have quoted to supply 3m length of Oily Tube with Bulkhead Connectors to be mounted on the Main Junction Box. The final specification and manufacturing drawings to be agreed. 6600V / 60Hz / 4 Pole motors / double end drive for Hydraulic Power Pack. These motors being used to power Sauer Danfoss Series-90-250 hydraulic pumps. The requirement being for either 400kw or 500kw motors, double ended drive, 6600V, 60Hz, 4-pole, with subsea connector to be defined. Our ROV20-4 type motors, 4-pole/6600vac/3 phase/60hz, with stainless steel construction. Double Ended for fitment with Sauer hydraulic pumps Series-90, with Subsea Connectors for Power and Sensors. We can offer the ROV20 motor with shafts at both ends, to mate with the Sauer Series 90 pumps that you intend using. New submersible motors. These motors being used to power Sauer Series-90-L250 hydraulic pumps. The requirement being for 400kw, single ended drive, 3300V / 60Hz, 4-pole, with subsea connector to be defined. The motors being required for an underwater vehicle. Our ROV20-4 motors, 400kw/4 pole/3300vac/3 phase/60hz, with stainless steel construction. Single ended for fitment with Sauer hydraulic pumps Series-90-L250, with subsea connectors for power and sensors. Our purpose built submersible pump motors are designed specifically for use in the horizontal axis. SME motors are compensated for depth pressure using oil rather than distilled water as in the case of down-hole pump motors. Our superior Mylar coated windings are the ultimate in winding coating technology. Mylar coated windings have an insulation rating of >16kV at a temperature of 140 degrees C.
Water detector As per drawing attached. Connectors Power Oily tube connection. Sensors. Interface Single ended to suit a Sauer series 90 L250 Hydraulic pump, splined shaft option F1. 300kW/ 3300V / 60Hz / 4 Pole motors for Hydraulic Power Pack. 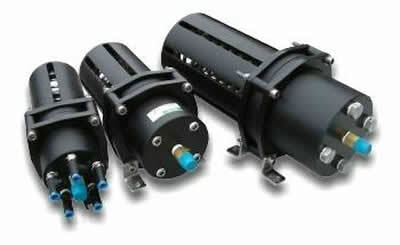 New submersible motors (with option for one additional motor to fulfil your spares commitment). These motors being used to power Sauer Series-90 hydraulic pumps. The requirement being for 300kW, double ended drive, 3300V / 60Hz, 4 pole, with subsea connector to be defined. ROV20-4 motors, 300kw/4 pole/3300vac/3 phase/60hz, with stainless steel construction. Double Ended for fitment with Sauer hydraulic pumps Series-90, with Subsea Connectors for Power and Sensors. We can offer the ROV20 motor (as per the attached drawing) with shafts at both ends, to mate with the Sauer Series 90 pumps that you intend using. Our purpose built pump motors are designed specifically for use in the horizontal axis. Unlike a down-hole pump motor such as the HT Sumo, our motors do not use pivot shoe thrust assemblies. As a result our motors are compensated for depth pressure using oil rather than distilled water as in the case of down-hole pump motors. Our superior Mylar coated windings are the ultimate in winding coating technology. Mylar coated windings have an insulation rating of >16kV at a temperature of 140 degrees C. No other winding coating even comes close to this standard. 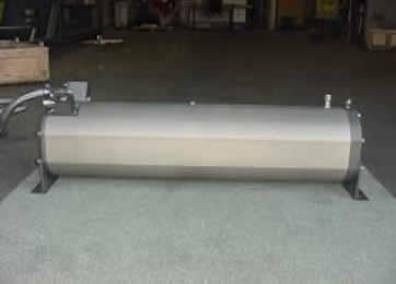 100 HP ROV Submersible Motor – Immediately Available. 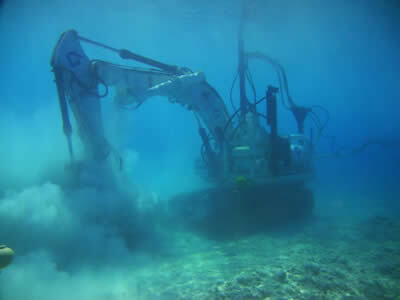 Silvercrest-SME has placed a 100Hp submersible Rov motor (as illustrated below) on standby. For emergency availability to all Rov operators. The motor has the following specification and is a direct drop in replacement for the Curvetech 100HP unit. 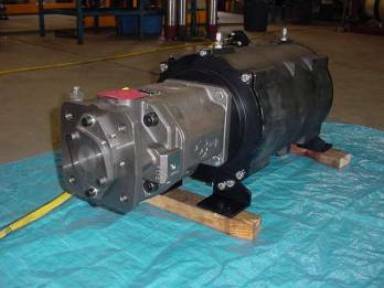 The motor is presently set up to receive a Rexroth A10VSO140 pump, but can be modified to accept other pump models if required. The motor is brand new, direct from our factory and has been constructed specifically for this purpose. Mil Spec hard-anodised T6 hardened 6061 grade Aluminium construction, with all 316 hardware. Rotor dynamically balanced. Oil filled externally compensated. 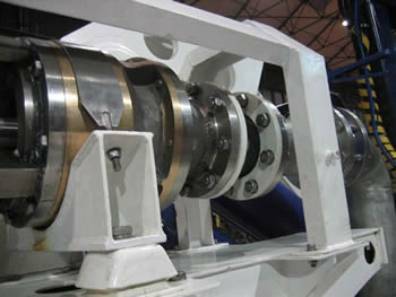 Fully performance tested on Dynamometer at rated voltage and frequency, subsea connectors for power and instrumentation. Designed for maximum electrical efficiencies to reduce full load currents. Motor designed for low operating temperatures to extend reliable lifespan. Specialised winding insulation system to ensure long operating life even under the most arduous of duties. On Deck operation generally allowable. Silvercrest/SME offer a wide range of electric submersible, subsea and ROV motors, together with hydraulic pumps and water pumps for subsea operations. We can supply ROV- HPU submersible motors from 5W to 400kW. Trenching HPU submersible motors from 100kW to 500kW, trenching jetting- pumps, plough HPU submersible motors, plough jetting-pump sets, turbine and centrifugal water pumps, hydraulic pumps, Rexroth pumps A7 and A10 series, and Sauer 90 series. SME ROV14, 150Kw, 4 Pole, 3000/3/50, 1490rpm Stainless Steel Construction Subsea Motor designed to close couple to Rexroth A11VLO190DRS-11-LN-12N00 Hydraulic Pump. The motor will cool itself in the ambient seawater. Sensors and electrical connector are included in the motor price. SME ROV14-2, 150kw, 2-Pole, 3000/3/60, SS316 Construction Subsea Motor fitted with 250GM-4C-177-3550 Nickel Aluminium Bronze Pump to produce 210m3/Hr (two pumps 420m3/h). Absorbed Power 130kW with 151kW Non Overloading. The final technical specification and manufacturing drawings to be agreed upon placement of the order by the client. SME ROV16-2, 400kW, 2-Pole, 3300/3/60, SS316 Construction Subsea Motor with integral Thrust Bearing and Interface to suit operation with your Water Pump (vertical operation). The final specification and manufacturing drawings to be agreed upon placement of the order. The motor will be manufactured to your exact requirements as indicated in your specification, and the SME drawings. SME ROV12-2 48kW 65HP 2-pole 3000/3/50 Aluminium Construction ROV Motor fitted with Rexroth A10VO28DFR1/31R-PSC62N00 Hydraulic Pump. Motor to have Oily Tube connection for Power Leads. Fitted with Temperature Sensing and Water Detectors terminated on Subconn or similar connector. Power Conductor and Sensor Connector Blocks to be in the same position on the motor at opposite ends (or as required). SME ROV228, 325kW, 8-pole, 3300/3/60, SS316 construction, Subsea Motor to drive Water Pump. Motor to include Water Detector and Temperature Detector terminated at Subconn Connector. Power terminated through Oily Tube Connection. Motor to have standard deep groove bearings absorbing no thrust. Motor for horizontal use. 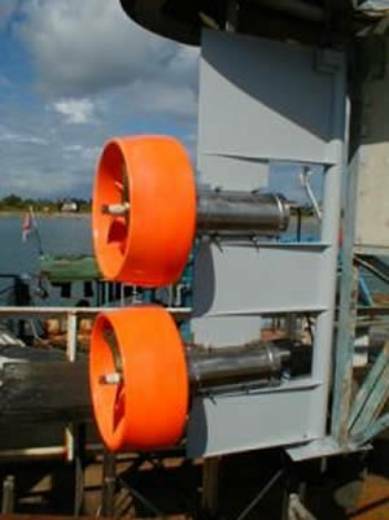 Motor designed for continuous operation and will provide at least two minutes of unloaded operation on deck. Epoxy coated for protection. Submersible motor for operations at 6000m water depth. We are pleased to offer our SME ROV22-12, 150kW, 12-Pole, 500rpm, 3300/3/50, SS316 Construction Subsea Motor. This motor will be manufactured to your exact requirements, and to interface with your submersible pump. SME ROV14-2, 186kW 250HP, 2-Pole, 3300/3/50, SS316 Construction Subsea Motor, with Flange and shaft to interface with Water Pump. Submersible Motor. Power 15 kW, Speed 2910 1/min, voltage 3.3kV, working depth 300m. SME ROV10-2, 15kW 20HP, 2-Pole, 3300/3/50, SS316 Construction Subsea Motor, with Flange and shaft to interface with Water Pump. We can offer motors at both 3300v and 6600v. However in order to offer a detailed quotation, we will need additional information from you concerning the motor application, materials of motor construction that you require (SS316 is suggested), Pump Thrusts, Pump Interface, etc. Please email us as much information as possible, and perhaps a pump drawing or technical data sheet. We will then revert back to you. 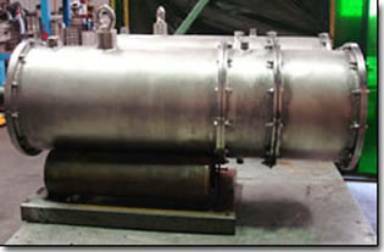 A submersible 280/300kW Electric motor, 3000VAC @60Hz, for subsea application (500uwm), 1800rpm (for Hydraulic pump coupling). We can offer our SME ROV18-4, 300kW, 4 Pole, 1800rpm, 3000/3/60, SS316 Construction Subsea Motor to drive Hydraulic Pump. A 40kW electric motor, 3000VAC @60Hz, for subsea application (500uwm), 1800rpm (for Hydraulic pump coupling). We can offer our SME ROV10-4, 40kW, 4 Pole, 1800rpm, 3000/3/60, SS316 Construction Subsea Motor to drive Hydraulic Pump. A 250kw, 4-pole, 3300/3/50 motor, SS316 Construction. Motor to interface with a A4VG250 Hydraulic Pump. We can offer you motors to meet your specific requirements. SME ROV14-4, 250kw /335Hp, 4-Pole, SS316 Construction, 3300/3/50 Subsea Motor. To Interface with your A4VG250 Hydraulic Pumps. SME ROV18-4, 400kw, 4 –Pole, 3300/3/60, SS316 Construction, Subsea Motor. To suit Sauer Danfos 90L 250 ump. The final specification and manufacturing drawings to be agreed upon placement of the order. 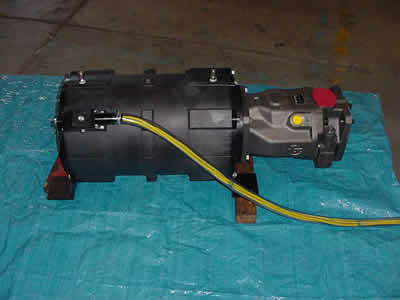 A 7.5kw motor to replace an obsolete 7.5kW / 2000V / 4 pole / 60Hz Motor based on a Ziehl-Abegg winding set. We can offer you our SME ROV10-4, 7.5kW, 4 pole, 2000/3/60, Aluminium Construction Subsea with Burton Connector. Motor flange and shaft would be to suit pump type, and motor can be oily tube or connector. The final specification and manufacturing drawings to be agreed. Subsea Digger (pictured above) fitted with SME ROV14-4 75Kw/100HP, 4-pole, 3000/3/60, anodised aluminium subsea motors. Double-ended motors with Interface to suit Sauer and Kawasaki Hydraulic Pumps. Silvercrest/SME have recently supplied six 400kw ROV 20-4 motors, 4pole/3300vac/3 phase/60hz, stainless steel construction. Single ended for fitment with Sauer hydraulic pumps Series-90-L250. Rated for 3000m depth operations. Also three ROV204 submersible motors (300kw/4 pole/3300vac/3 phase/60hz) with stainless steel construction, and double ended for fitment with Sauer hydraulic pumps to SMD-Hydrovision. Together with 7.5kw motors for Rov cursor application. These subsea motors being used for new trencher vehicles under construction. In addition we have manufactured and delivered in just six weeks from order, ten 260Kw submersible motors to CTC Marine Projects based in Teeside, England. The motors will be used by CTC on their subsea plough and trenching vehicles worldwide. Silvercrest/SME will bespoke manufacture virtually any shape and size of submersible motor required for subsea and Rov operations. 100HP ROV Subsea Motor - Immediately Available. Notice to all Rov operators. Silvercrest-SME has placed a 100Hp submersible Rov motor on immediate standby. For emergency availability to all Rov operators. The motor has the following specification and is a direct drop in replacement for the Curvetech 100HP unit. The motor is presently set up to receive a Rexroth A10VSO140 pump, but can be modified to accept other pump models if required. Mil Spec hard-anodised T6 hardened 6061 grade Aluminium construction, with all 316 hardware. Rotor dynamically balanced. Oil filled externally compensated. Fully performance tested on Dynamometer at rated voltage and frequency. Subsea connectors for power and instrumentation. Designed for maximum electrical efficiencies to reduce full load currents. Motor designed for low operating temperatures to extend reliable lifespan. Specialised winding insulation system to ensure long operating life even under the most arduous of duties. On Deck operation generally allowable. For all your Rov motors, Subsea motors and Submersible motor / pump requirements, please contact us at any time. SUBSEA and SUBMERSIBLE THRUSTER SYSTEMS. Silvercrest in conjunction with SME are able to offer a complete range of submersible motor systems to meet the demanding requirements of the Rov, sub-sea trenching, and manned submarine industries. Manufactured to exacting standards, our motors are more competitively priced than any comparable motors on the market today. ROV MOTORS / TRENCHING REPLACEMENT MOTORS. We offer a standard range of direct replacement motors, designed as a direct replacement to fit into many of the more popular ROVs and trenching systems in use today (for example, the Perry, Hydrovision and Slingsby underwater systems). For example, the picture below shows an SMD-Hydrovision 200HP ROV Curvetech motor (bottom) beside a Silvercrest/SME motor (top). The SMD motor is somewhat larger and heavier than the equivalent motor manufactured by ourselves. Our ROV14-4 200HP motor that we presently build in various numbers for another offshore client is both smaller in size and lighter in weight..
Silvercrest can offer bespoke manufacturing of motors to meet your specific requirements. We recently completed the design of a 290HP / 300VAC trenching motor for use in subsea trenching operations. Also available upon request are matched High Voltage Transformer Units (HVTUs) and electronic soft starts for each standard replacement motor. HVTUs are custom built to your specification. MANNED WET and DRY SUBMARINE PROPULSION SYSTEMS. Historically, over the last fifteen years electrical submarine thruster systems have been problematic. Notably AC motor controllers and DC brush motor powered thrusters have been the cause of many a company’s downfall. Other problems such as 120VDC battery buss voltages have compounded the overall problem. Since the early tourist submarines first came into use during the mid 80’s, motor controller technology has steadily developed. Certain manufacturers have produced systems which have proven to be more capable and more importantly, reliable than their early counterparts. Unfortunately, this leaves quite a few of the older tourist and research submersibles struggling with the older unreliable systems that are still in use. A little known fact is that motor drive systems have a finite operating life, indeed they have a ‘shelf life’. This is due to the deterioration of the large capacitors used in the drive controllers. This occurs even when the drive is not in use. If a drive is more than five years old, then it’s capacitors are already approaching the end of their useful life. As a result these drives are now becoming tired and often prone to failure. Usually with accompanying pyrotechnics. Silvercrest has developed a new ‘replacement’ propulsion system for both new build and existing manned submarines. We tailor the installation to solve your propulsion requirements. Plus we will visit you on-site to assess your installation and determine the best route forward to solve your problems. Once the problems have been identified and assessed, where needed, we will re-design your battery buss arrangement to produce a working voltage suitable to run a reliable and powerful thruster system. We will then design the motors specifically to meet your requirements. The pressure compensation system is added and the final stage of the design process is matching the correct drive with your new motors. Recently Silvercrest completed the installation of our 69kW (6 x 11.5kW) AC propulsion and ballast system into one of the Odyssey class tourist submarines in Southeast Asia. The system utilizes a state of the art, purpose built, 11.5kW thruster / ballast pump motor. A custom built submersible, 3 phase, AC, squirrel cage induction motor encased in a 316 Stainless Steel compensated housing. The motor was designed specifically to match the available buss voltage and it’s dedicated motor invertor controller. The Silvercrest motor is smooth, quiet and powerful. Motor control is supplied through a CT Commander SE invertor controller drive. Manufactured by one of the leading drive manufacturers in the world today. Each drive utilizes digital control using an onboard processor with EEPROM data storage. This allows the drive to store operating parameters and it’s own operating history for maintenance and fault diagnosis purposes. A twin Burgmann tandem mechanical shaft seal arrangement, fitted on each motor shaft, provides protection from water ingress. This works in conjunction with a custom built 33 Lt capacity oil-filled central motor compensation system. Great attention has been applied to designing our motor systems for reliability and a long working life. All components are rated to at least 150% of required working capacity. This over rating of individual components ensures that no single part of the system can ever be overloaded during correct use. Specific motor functions and operational profiles can be catered for and programmed into the CT controller. For example the Odyssey system has a ‘Turbo’ function, whereby the motors run normally with a 7.5kW max output. At the flick of a switch on the pilot’s console, the motor can be enabled to output it’s maximum 11.5kW (for 1½ minutes) for use in manoeuvring emergencies. Motors and drives of various ratings are available from Silvercrest, utilizing many of the same frame parts. 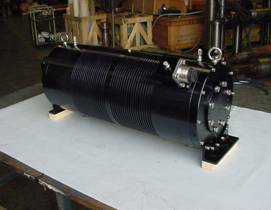 For example our 15kW motor utilizes the exact same parts as the 11.5kW unit, but with more motor laminations and therefore a slightly longer body. This reduces your spares requirement even when mixing and matching the motor sizes. Military spec versions of the motors are also available on request. New lateral thruster (Tourist submarine refit). Silvercrest offer a return to dealer, two-year warranty on all parts, subject to correct usage and subject to our standard terms & conditions. Silvercrest 11.5kW / 240VAC Thruster Units for Large Tourist Submarine. Compensation Oil Filled – external compensator, ambient or over pressure. Seals Twin, Tandem Mechanical Shaft Seals. Material Anodised Aluminium or 316 Stainless Steel. Motor controllers for a manned submarine. Other SME SubSea Motors and Motor-Pump sets. ROV Motor ROV12, 65HP, 3000v + Rexroth pump. SME ROV12-2 48kW 65HP 2-pole 3000/3/50 Aluminium Construction ROV Motor fitted with Rexroth A10VO28DFR1/31R-PSC62N00 Hydraulic Pump. Motor with Oily Tube connection for Power Leads. Fitted with Temperature Sensing and Water Detectors terminated on Subconn or similar connector. Power Conductor and Sensor Connector Blocks to be in the same position on the motor at opposite ends. Submersible Motors for Water-Jetting Pumps. SME ROV14-2, 200HP, 150kW, 2- pole, 3000/3/60 motor. Anodised Aluminium Construction. To suit operation with Water Jetting Pump. Fitted with Subconn connector Type MCBH4M. Flange and Shaft requirements to be advised by customer. Submersible Motor ROV14, 200KW, 4-poles, 3000v motor + Rexroth pump. SME ROV14, 200kW, 268HP, 4 Pole, 3000/3/50, 1490rpm Stainless Steel Construction Subsea Motor designed to close couple to Rexroth A11VLO190DRS-11-LN-12N00 Hydraulic Pump. The motor will cool itself in the ambient seawater. Sensors and electrical connector included in the motor price. Rexroth pump A11VLO190DRS-11-LN-12N00. Hydraulic Pump with Horsepower Limiting Controller. Subsea Motor. 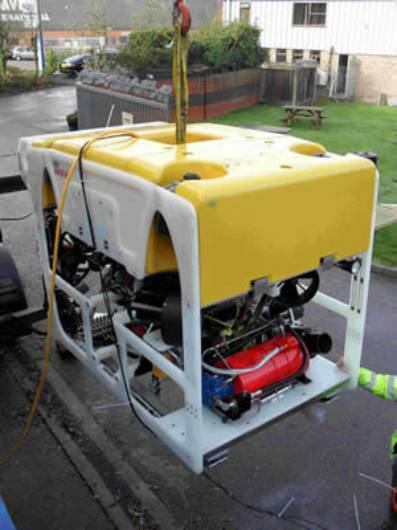 SME ROV14-4, 125HP, with Vickers Hydraulic Pump. SME ROV14-4, 93kW 125HP, 4-Pole, 3000/3/50, Anodized Aluminium Construction with Vickers PVH141-Q1C Hydraulic Pump. 500KW MOTOR with HEAT EXCHANGER. SME can design and build SUBSEA motors to suit most requirements. Anodised aluminium, or 316 stainless steel construction. 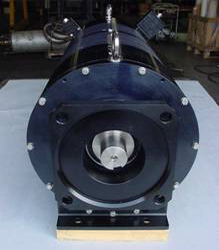 Power drive to load using an output shaft with a standard coupling, or close coupled. Single drive shaft, or a drive shaft at both ends, (double shaft extension). SME design their motors so they do not run hot. Typical motors can run on deck for at least 10 minutes on full load, with no cooling, without overheating. The motors are designed to be compact in size and suitable for heavy-duty applications, such as subsea trenching. If weight is important, SME can design the motor for minimum weight by utilising an aluminium construction and a hollow motor shaft, etc., while still ensuring the motor is generously rated for full load operation. 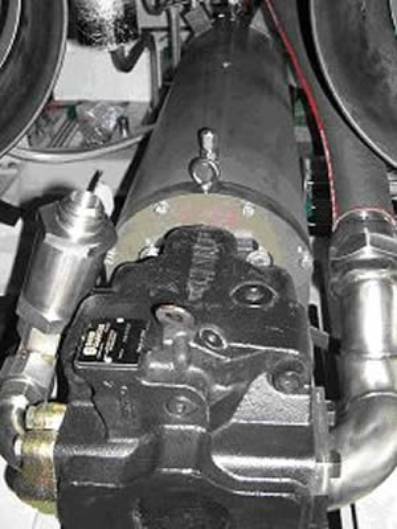 If the motor is going to drive a hydraulic pump we recommend a close-coupled arrangement to save the weight of the coupling and the coupling housing. SME can design and build motors for all voltages from 24 Volts to 4160 Volts with 50Hz or 60Hz frequencies, or for VVVF requirements. High Voltage motors can have random stator windings, or formed coils, depending on space and weight constraints. The winding wire for the High Voltage motors is double insulated and passes a twisted wire test at 16,000 volts and is rated up to 155 Deg.C. All windings are designed to keep 'turn to turn' voltage to a minimum. All winding materials and cables, etc. are specially selected to be suitable for use in hydraulic oil. 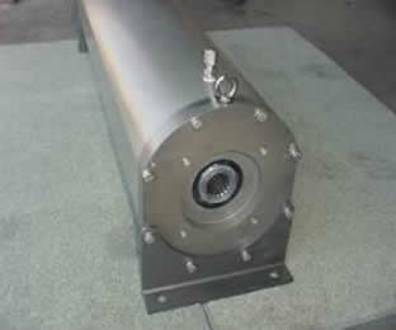 In general the SME subsea submersible motors have low loss lamination steel (3 Watts/kg), which allows for higher flux densities, and less heat, with less material and weight. All motors are oil filled and we recommend hydraulic oils for good lubrication characteristics, in preference to electrical oil that has better di-electric capabilities, but worse lubrication capabilities. Thruster motors can be designed and built for voltage/speed control, which is a relatively simple speed control system, and they can also be built with a thrust bearing incorporated to take the thrust load from the impeller. All ball bearings are from well-known brands such as SKF, FAG, or NSK. Oil seals are high temperature and typically made from Viton. Mechanical seals are typically Burgmann. The preferred power cable entry system for SME motors is to use an "oily tube" connected to an adaptor that is part of an oil tight rubber gland that is fixed to the stator frame. SME do not recommend bringing the power cables through the end shields of the motor because this creates additional complications when the motors are stripped down during service, because the end shields cannot be readily removed from the stator. Subsea connectors can be offered as an alternative to the Oily Tube if requested. SME strongly recommend that the motors are supplied with PT100s fitted in the windings and also in the bearings and that the internal motor temperatures are monitored and set up to alarm if the temperatures rise above the "norm". SME can also offer additional protection with a water detector, etc. The auxiliary connections for PT100s, etc. can be made through standard high pressure, water tight, plug and sockets as supplied by "Subconn", "Impulse", and "Burton". These are also fitted to a connection block on the stator, not on the end shield. All motors are rated for continuous operation and all prototype motors are full load performance tested at rated voltage and rated frequency to confirm their performance characteristics. All motors can be issued with a "Type Test Certificate" or even full load tested at additional cost, if required. At SME we are continually working on improving the performance of our products and for this reason we reserve the right to make changes without notice to any of the data in this brochure. Please contact us direct for confirmation of any drawing dimensions or performance data. SME design, manufacture, and supply, submersible electric motors for bore holes, SUBSEA vehicles, and ROV electric motors for SUBSEA equipment, submersible electric motors for sump pumps, and any special purpose submersible electric motor requirements.